, an English divine, son of the rev. John Jackson, first rector of Lensey, afterwards rector of Rossington, and vicar of Doncaster in Yorkshire, was born at Lensey, April 4, 1686. He was educated at Doncasterschool under the famous Dr. Bland, who was afterwards head master of Eton-school, dean of Durham, and from 1732 to 1746 provost of Eton college. In 1702, he was admitted of Jesus college, Cambridge; and, after taking the degree of B. A. at the usual period, left the university in 1707. During his residence there, he learned Hebrew under Simon Ockley, the celebrated orientalist; but never made any great proficiency. In 1708, he entered into deacon’s orders, and into priest’s two years after; when he | took possession of the rectory of Rossington, which had been reserved for him from the death of his father by the corporation of Doncaster. That politic body, however, sold the next turn of this living for 800l. and with the money paved the long street of their town, which forms part of the great northern road. In 17)2, he married Elizabeth, daughter of John Cowley, collector of excise at Doncaster; and, soon after, went to reside at Rossington. In 1714, he commenced author, by publishing three anonymous letters, in defence of Dr. S. Clarke’s “Scripture-Doctrine of the Trinity,” with whom he soon after became personally acquainted and nine treatises by Jackson on this controversy, from 1716 to 1738, are enumerated in the supplementary volume of the “Biographia Britannica.” In 1718, he offered himself at Cambridge for the degree of M. A. but was refused on account of his heretical principles. 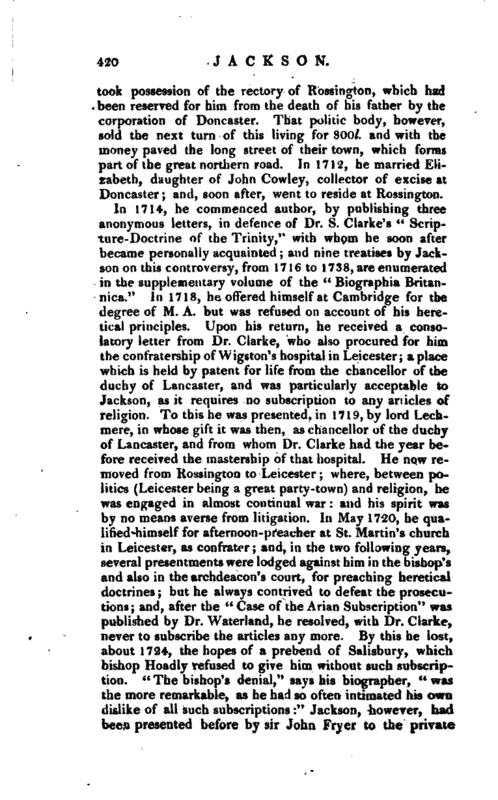 Upon his return, he received a consolatory letter from Dr. Clarke, who also procured for him the contratership of Wigston’s hospital in Leicester; a place which is held by patent for life from the chancellor of the duchy of Lancaster, and was particularly acceptable to Jackson, as it requires no subscription to any an ides of religion. To this he was presented, in 1719, by lord Lechmere, in whose gift it was then, as chancellor of the duchy of Lancaster, and from whom Dr. Clarke had the year before received the mastership of that hospitah He now removed from Rossington to“Leicester; where, between politics (Leicester being a great party-town) and religion, he was engaged in almost continual war: and his spirit was by no means averse from litigation. In May 1720, he qualified himself for afternoon-preacher at St. Martin’s church in Leicester, as confrater; and, in the two following years, several presentments were lodged against him in the bishop’s and also in the archdeacon’s court, for preaching heretical doctrines; but he always contrived to defeat the prosecutions; and, after the” Case of the Arian Subscription“was published by Dr. Waterland, he resolved, with Dr. Clarke, never to subscribe the articles any more. 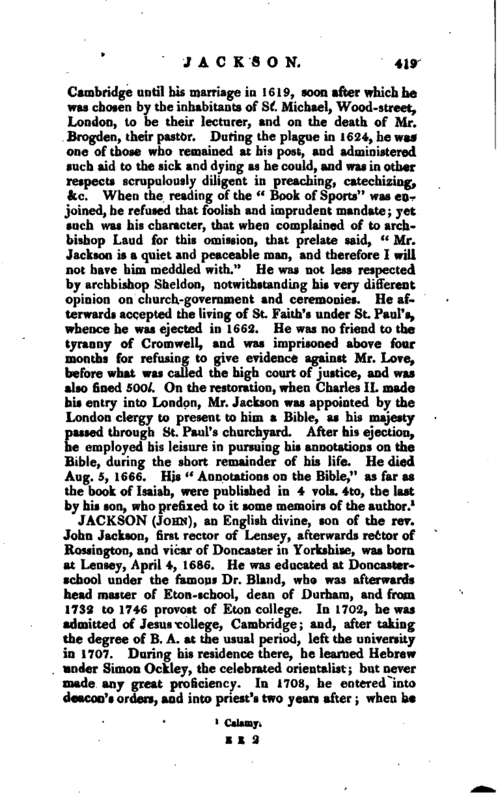 By this he lost, about 1724, the hopes of a prebend of Salisbury, which bishop Hoadly refused to give him without such subscription.” The bishop’s denial,“says his biographer,” was the more remarkable, as he had so often intimated his own dislike of all such subscriptions:" Jackson, however, had keen presented before by sir John Fryer to the private | prebend of Wherwell in Hampshire, where ho such qualification was required. On the death of Dr. Clarke, in May 1729, he succeeded, by the presentation of the duke of Rutland, thdn chancellor of the duchy of Lancaster, to the mastership of Wigston’s hospital, which situation he preserved to“his death. The year before, 1728, he had published, in 8vo,” Novatiani Opera, ad antiquiores editiones castigata, & a multis mendis expurgata:“and now, intent upon books, and perhaps the more so by being incapable of rising to preferment, ha continued from time to time to send out various publications. In 1730,” A Defence of Human Liberty, against Cato’s Letters;“and, in the second edition,” A Supplement against Anthony Collins, esq. upon the same subject.“In 1730 and 1731,” Four Tracts in Defence of Human Reason, occasioned by bishop Gibson’s second Pastoral Letter.“In 1731, a piece against” Tindal’s Christianity as old as the Creation;“in 1733, another by way of answer to Browne bishop of Corke’s book, entitled” Things Divine and Supernatural, conceived by Analogy with Things Natural and Human;“in 1734,” The Existence and Unity of God, &c.“which led him into a controversy with Law, and other writers; and, in 1735,” A Dissertation on Matter and Spirit,“with remarks on Baxter’s” Inquiry into the Nature of the Human Soul.“In 173G, he published” A Narrative of his being refused the Sacrament of the Lord’s Supper at Bath:" this had been done in a very public manner by Dr. Coney, and was the second refusal of that kind he had experienced; for, in 1730, he had been denied the use of the pulpit at St. Martin’s in Leicester, by the vicar, who set the sacristan at the bottom of the stairs to restrain him from ascending. In 1742, he had an epistolary debate with his friend William Whiston, concerning the order and times of the high priests. 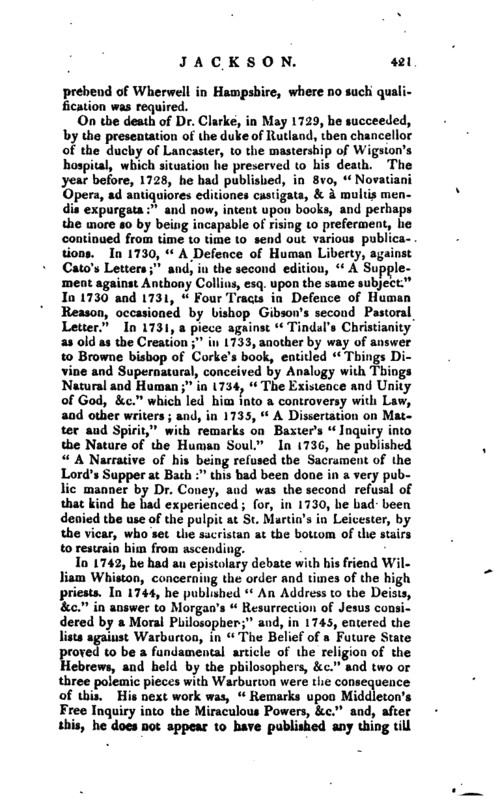 In 1744, he published “An Address to the Deists, &c.” in answer to Morgan’s “Resurrection of Jesus considered by a Moral Philosopher;” and, in 1745, entered the lists against Warburtori, in “The Belief of a Future State proved to be a fundamental article of the religion of the Hebrews, and held by the philosophers, &c.” and two or three polemic pieces with Warburton were the consequence of this. 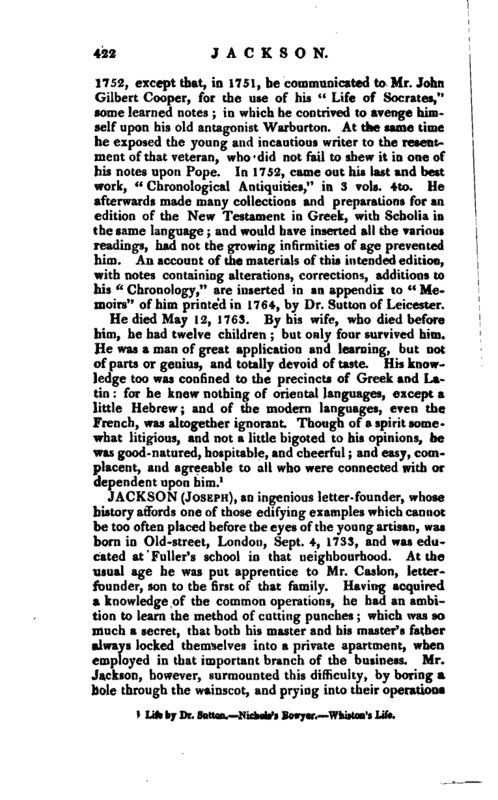 His next work was, “Remarks upon Middleton’s Free Inquiry into the Miraculous Powers, &c.” and, after this, he does not appear to have published any thing till | 1752, except that, in 1751, he communicated to Mr. John Gilbert Cooper, for the use of his “Life of Socrates,” some learned notes; in which he contrived to avenge himself upon his old antagonist Warburton. At the same time he exposed the young and incautious writer to the resentment of that veteran, who did not fail to shew it in one of his notes upon Pope. In 1752, came out his last and best work, “Chronological Antiquities,” in 3 vols. 4to. He afterwards made many collections and preparations for an edition of the New Testament in Greek, with Scholia in the same language; and would have inserted all the various readings, had not the growing infirmities of age prevented him. An account of the materials of this intended edition, with notes containing alterations, corrections, additions to his “Chronology,” are inserted in an appendix to “Memoirs” of him printed in 1764, by Dr. Sutton of Leicester. 1 Life by Dr. Sutton. Nichols’s Bowyer. Whiston’s Life.